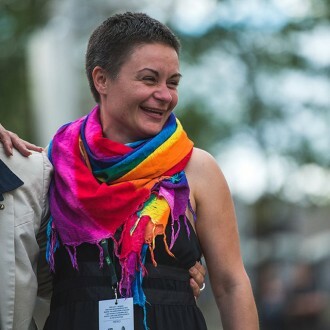 Previous PostFÉMININ/FÉMININ wins two "Prix Gémeaux"
Originally from Kharkiv, both women have been involved in the LGBT community and lesbian organizations for over ten years. The 2015 edition of Montreal Pride was marked by the celebration of many women of influence. Among them we find Anna Sharyhina, a petite brunette with smiling eyes. 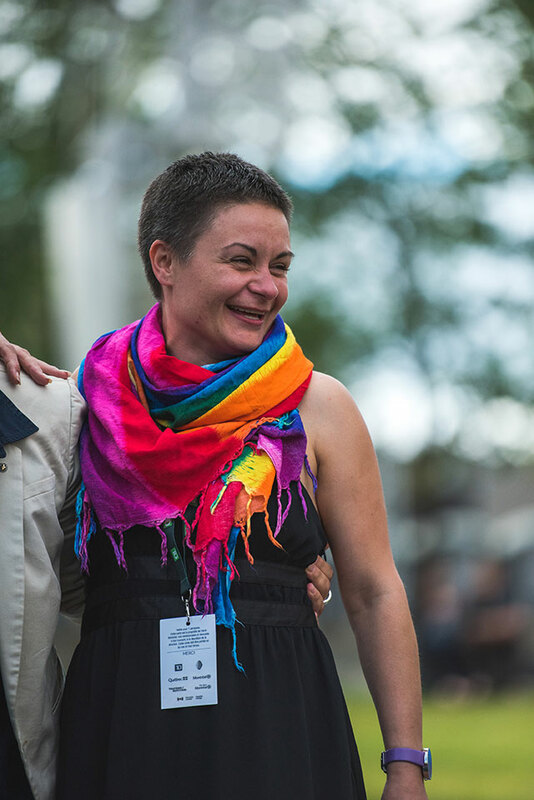 She is the director of Kyiv Pride, the organizing committee of the Ukrainian capital’s Pride Parade. Accompanied by her partner Vira Chemygina, they spoke to LSTW about their stance in the fight for lesbian rights as well as women’s rights in a nation undergoing important social change. Hearing about their experiences is in and of itself a lesson in humility. Upon arriving at the Lez Spread The Word 6 to 9 event held on the rooftop terrasse of Club Unity, Anna and Vira were astonished by the diverse grouping of women all in celebration. “In Ukraine, there is an important divide between gay (male) organizations and lesbians,” explains Anna. “The gay movement is stronger now because of certain initiatives that have been taken in regards to the fight against AIDS. In turn, it has allowed the community to also raise funds for causes surrounding homosexuality. Lesbians, however are not taken into account,” she continued. Vira sarcastically adds that “this is obviously because lesbians don’t have any problems”. In Ukraine, lesbians have continuously been forgotten in the fight against discrimination which first began in the early 2000s. Often forced to pay higher cover fees for gay clubs, lesbians do not have access to their own venues. Sadly, they were also mocked for their modest initiatives and received no logistical or financial support from other Ukrainian LGBT organizations. “In the end, we told them that they had no right to speak about us or for us. Eventually though, they accepted to help us which is why more emphasis was placed on lesbians at this year’s Kiev Pride,” explains Anna. 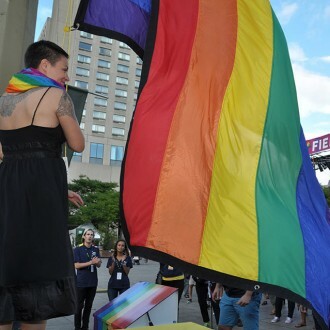 According to Vira, the current situation for homosexual women is steadily improving as lesbian rights associations continue to gain ground and funding, notably from abroad. “We are not relaxing our efforts, if anything, we are striving to do more. We are coming together in order to make connections, find solutions to our problems and organize activities. It is important to build a sense of community”. Originally from Kharkiv, both women have been involved in the LGBT community and lesbian organizations for over ten years. When asked about what inspired the to become involved in the change, their responses was the same. Vira recalls that, “no one was doing anything […] When reading our literature and learning our laws, I asked myself how I could live and be safe in this world. So I decided to change things. First in our town and then in our country”. In answer to this question, Anna recounts something from her studies in psychology, “everyone said that homosexuality was a mental disorder, a disease. But it is society that has an illness. And we are moving forward step-by-step”. Over time, many battles have been won in Ukraine. The second walk for equality in Kiev was accompanied by police and supported by many public figures like Ukrainian President Petro Poroshenko, deputies and ambassadors from countries abroad. There were more participants than the previous year and the media coverage was positive. However, the walk only lasted 15 minutes because of violent attacks against those marching. Anna explains that “this year’s walk was terrifying. Extreme-right activists shot at us. It was dangerous, but we remain hopeful. Next year, we want to open the march with allies in order to show the scale of support that the LGBT community has and to dissuade violence”. Both women accept that there is a price they must pay for these small victories. “I have a son and I worry for him,” confides Anna. “ In September, he will return to school for the first time since the march for equality and I wonder how his friends will act”. As for Vira, she knows that she risks her parents finding out about her volunteer activities and consequently her sexual orientation. “I try to be discrete but if one day they see my holding up a gay flag, well that’s just how it is. I’ve always been a lesbian and I am not afraid of what society thinks about me,” she states. With regards to their trip to Montreal, Anna says, “It’s amazing how open and warm people are. I’ve never had the chance to be openly gay, proud and without fear. It makes me want to attain the same thing in Ukraine. But I don’t know how to apply what I have seen here back at home, a place where people still think that homosexuality should remain hidden”.